Coral reefs are at risk from an acidifying ocean.Credit: <a href="http://commons.wikimedia.org/wiki/File:Reef0814_-_Flickr_-_NOAA_Photo_Library.jpg">David Burdick | NOAA via Wikimedia Commons</a>. A new and alarming paper in the prestigious journal Science reports today that the world’s oceans may be acidifying faster now than at any time during the four major extinctions of the last 300 million years, when natural pulses of carbon sent global temperatures soaring as much as 6 degrees C (10.8 degrees F). The study is the first of its kind to survey the geologic record for evidence of ocean acidification over such a huge time frame. In the past century, due to fossil fuel emissions, atmospheric CO2 has risen about 30 percent. The oceans have sequestered about a third of that, making them ~30 percent more acidic, as pH has fallen from 8.2 to 8.1. 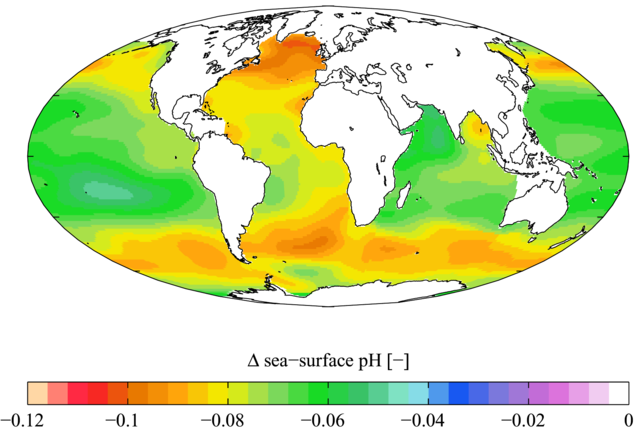 Estimated change in annual mean sea surface pH between the pre-industrial period (1700s) and the present day (1990s): Plumbago via Wikimedia Commons. When pH dropped to 7.8 in coral reefs off Papua New Guinea, diversity declined ~40 percent. 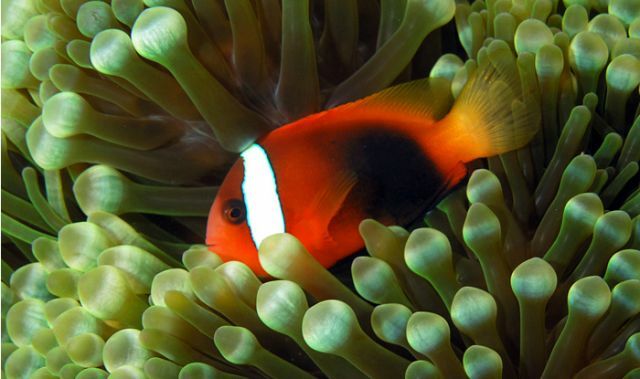 When pH drops below 7.8, clownfish larvae in the lab lose their ability to smell predators or find their way home. That amounts to a gargantuan change in chemistry, which has reduced carbonate ion concentrations in seawater by ~16 percent. Carbonate ions are needed for marine life to make their shelters—their reefs and shells. Which means that rising acidity threatens the survival of entire ecosystems from phytoplankton to coral reefs, and from Antarctic systems reliant on sea urchins to many human food webs dependent on everything from oysters to salmon. The Science paper authors reviewed hundreds of paleoceanographic studies and found evidence of only one period in the past 300 million years when the oceans changed at even close to the rate they’re changing today. That was the Paleocene-Eocene Thermal Maximum 56 million years ago, when rapid extinctions in the sea and on the land changed Earth’s menagerie of life forever. Cinnamon clownfish (Amphiprion melanopus): Nick Hobgood via Wikimedia Commons. Ocean acidification may have severe consequences for marine ecosystems… We review events exhibiting evidence for elevated atmospheric CO2, global warming, and ocean acidification over the past ~300 million years of Earth’s history, some with contemporaneous extinction or evolutionary turnover among marine calcifiers. Although similarities exist, no past event perfectly parallels future projections in terms of disrupting the balance of ocean carbonate chemistry—a consequence of the unprecedented rapidity of CO2 release currently taking place.